This post was originally written in 2011, but updated in 2019. 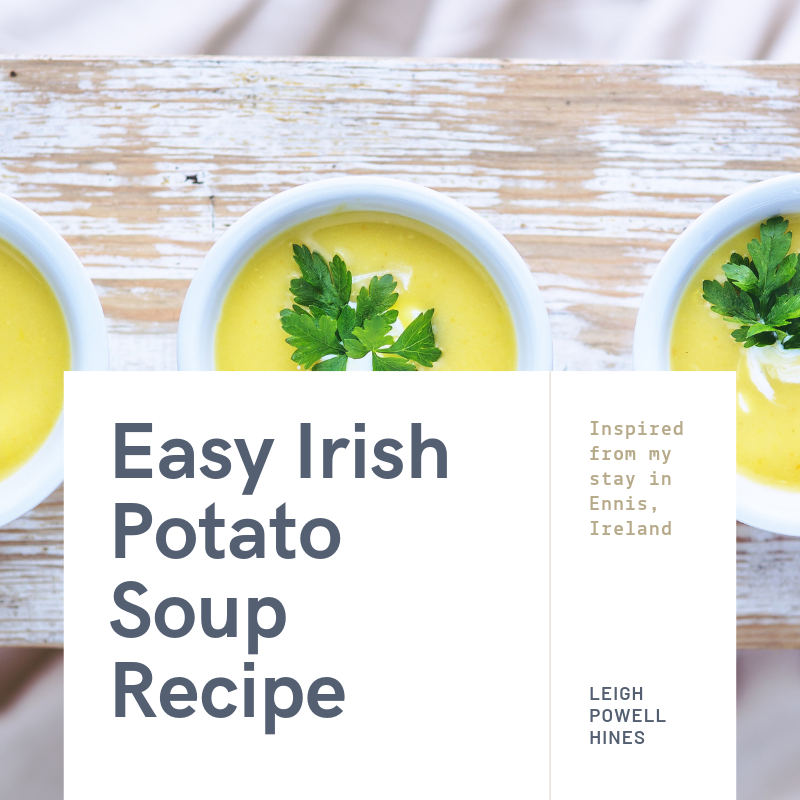 This soup recipe is also part of an All Things Irish post with Chapter Two Collective, check out their story for other St. Patrick's Day related recipes, decor and travel ideas. 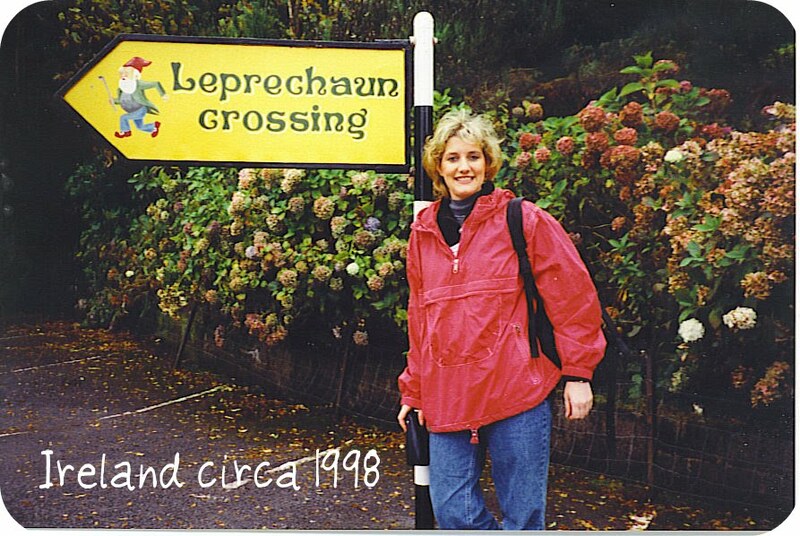 I have very fond memories of a trip I took to Ennis, Ireland in 1998 with my college roommate. We stayed at the Old Ground Hotel in Ennis and toured the area for a week. It was an alumni trip with UNC-Chapel Hill and it was spectacular. This getaway was way before social media and cell phone photography. My photos are in an album stored away. After a quick web update almost thirty-one years later, The hotel still welcomes guests in this Irish town, looks totally refurbished and I would stay there in a heartbeat again. This little town was perfect in every way. It was walkable. It was small. The entire experience was probably one of the best trips I've taken on a tour. 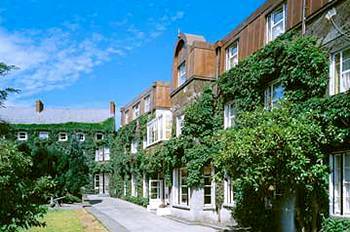 The Old Ground Hotel is located about 20 minutes away from Shannon International Airport and 40 minutes away from the Cliffs of Moher. I also dined at Durty Nelly's, a four-hundred-year-old pub in Bunratty, adjacent to the castle and I had some of the best carrot soup I think I've ever tasted. We traveled to County Clare in October, and it was quite cold. I still remember the wonderful soups I had on this trip. I've always been a fan of potato soup so I started making it some upon my return. I adapted a recipe published in Southern Living in 1999. 5 large baking potatoes, peeled and cut into 1/4-inch thick slices. (I think my potatoes were on the smaller side so if you have smaller baking potatoes, I would recommend adding one or two more potatoes. The original recipe called for only three). Toppings: shredded cheddar, crumbled cooked bacon (I used no nitrates added turkey bacon), chopped fresh chives. Melt butter in a large saucepan over low heat; stir in onion and leek. Cover and cook 20 minutes. Stir in potatoes; cover and cook 15 minutes. Stir in broth, salt, and pepper; bring to a boil. 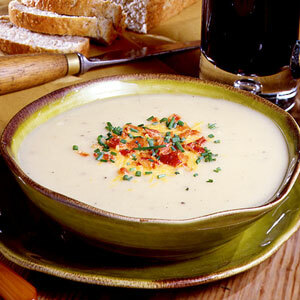 Reduce heat, and simmer 30 minutes or until potatoes are tender. Remove from heat, and cool slightly. The original recipe says to put the soup in batches in the blender. Instead, I took a mixer and pureed the soup in the pot. My suggestion is to let the soup cool though. I got a little splatter from a very hot potato! Reheat the soup over medium heat until heated. Serve with desired toppings. *Budget Note: The soup cost less than $10 to make, and that includes all the toppings. You will have enough for several meals. I made this soup decades before an Instant pot, but this recipe can easily be adapted for the Instant Pot. Other recipes I've read online also use red potatoes instead of baking potatoes. And a little throwback photo from when this post was originally written. My son was five. This post is made possible by Sims Orthodontics, the best Orthodontist in Pensacola Florida My thanks to my sponsors for keeping me at my desk writing and updating conent.